Let’s cut to the chase, this is a fine looking cigar with a band to match, and that’s really where my knowledge of this cigar stops. 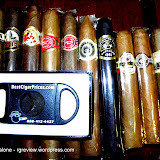 While I’ve not had a lot of experience with Perdomo cigars, I was once privileged to attend an event where Billy Perdomo was present and was demonstrating the master techniques of cigar rolling. 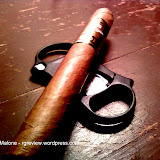 As I said, the Lot 23 is an impressive looking cigar, unfortunately I cannot really speak to much else. Allow me to explain. Pre-light thing were business as usual. Lot 23 boasts a Ecuadorian Connecticut-shade wrapper, housing both Nicaraguan binder and filler. The wrapper, while smooth did show a few pronounced veins and a could of minor nicks. 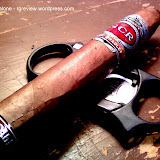 The aroma of this cigar reminded me of honey mixed with oak and topped off with a butter creaminess. Inviting to say the least. Upon making my initial cut of the double cap, a crack in the wrapper was produced. Apparently this particular cigar was tipping toward the dry side. Like most every smoker, I’ve found myself in this situation a time or two and usually it’s manageable. 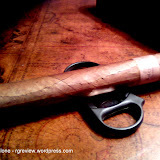 However, this time the crack protruded near an inch down the length of the cigar, almost touching the band. It is here one is faced with any given number of possibilities. One, scrap the cigar and smoke something else. Two, smoke it as is and hope the crack does not worsen. 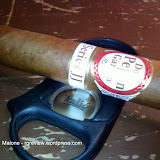 Three, give up cigar smoking altogether. Or four, opt for an experiment. I chose the experiment. Not sure what lead me to make my decision, but for whatever reason I thought it best to clip the cigar just below the crack. 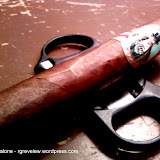 This required me to first remove the band; cutting off an inch of cigar at the head. This cut did cause the wrapper to loosen, as I expected it would. Rather than to proceed as normal from this point, I simply lit the freshly clipped head of the cigar and drew from the foot. In essence I smoked the cigar backwards. Surprisingly enough, this worked for a while, until about mid way thought the wrapper had come completely undone and thus rendered the cigar unenjoyable. I will say however, that for the time I was able to smoke and enjoy this cigar I picked up greater flavor notes of the initial honey, oak and buttery-creaminess. 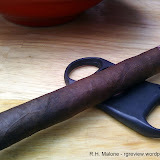 Adding to this were a subtle nutty flavor and even hints of white pepper (thank you Nicaraguan tobacco). The burn was even and true, and of course the draw was fine. Large billows of smoke filled the air and I would imagine had things gone along as normal this would have been quite a fine cigar. Unfortunately, yes it was. I don’t think it’s a quality control issue within Perdomo, but just a bit of bad luck with the storage (the B&M), not mine (necessarily). 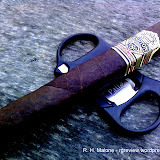 This is a good cigar however, thus I won’t let this little incident deter me.